THE SAN FRANCISCO 49ers landed Jimmy Garoppolo in a trade with the New England Patriots recently, but from the sounds of it, they would have been okay with either Patriots quarterback. According to Fox Sports’ Jay Glazer, when 49ers GM John Lynch called Bill Belichick and the Patriots about Garoppolo, they were initially rebuked by the Patriots, who didn’t want to give up on Garoppolo. But Lynch tried another route. According to Glazer, Lynch then asked about Tom Brady, much to Belichick’s amusement. In Lynch’s defense, the question might have been worth asking. The Patriots reportedly viewed Garoppolo as their future franchise quarterback after Brady. 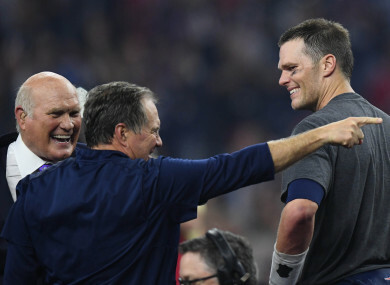 Though Brady hasn’t shown signs of slowing down at 40 years old, perhaps the Patriots would have been willing to talk return packages for Brady if it meant securing a future with Garoppolo. Email “The 49ers reportedly baffled Bill Belichick by asking if the Patriots would trade Tom Brady”. Feedback on “The 49ers reportedly baffled Bill Belichick by asking if the Patriots would trade Tom Brady”.